COOPERSTOWN - Mrs. Jane H. Patrick, of Cooperstown, passed away peacefully February 2, 2012, in her home in the Clara Welch Thanksgiving Home from complications related to pneumonia. Prior to living there, she had lived for over thirty years on Chestnut Street in Cooperstown. A native of Portsmouth, Virginia, she worked for several years during World War II in the fiscal department of the Norfolk Navy Yard before graduating from Mary Washington College. She then worked for the IBM Corporation in Washington, DC, where she met and married her husband, Selwyn "Pat" Patrick, in 1951. Jane and Pat raised their two sons in Kensington, MD, before retiring in 1972 to Cooperstown where they both became very active in the community. After Pat's death in 1990, Jane continued as an active volunteer at Bassett Hospital and was a trustee for the hospital from 1984 until 2005. She was admired for her ability to talk to anyone about anything. She was a member of the Women's Club of Cooperstown and served as its president from 1984-1986. She also served as a school guide at the Farmers' Museum, a volunteer at Fenimore House and as a substitute teacher at Cooperstown Central School. She was a member on the Foundation Board of Pathfinder Village and served as the chairman for two years. 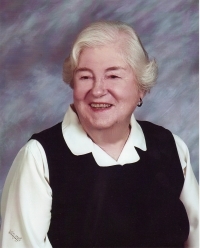 The Catholic Church was near and dear to her heart and Jane was an active parishioner at St. Mary's in Cooperstown. She served as a Lector and Eucharistic Minister and was active in the formation of the Eucharistic Ministry program at Bassett Hospital. Jane will be especially missed by her dearest friends, including the group she dined out with known as the "Dinner Belles". In addition to being missed by the Village of Cooperstown, she will be very missed by her family. She was the center of their world. Jane is survived by her sister, Ethlyn Howard of Portsmouth, VA, and her sons, John and his wife Lori of Endicott and David and his wife Sally of Boston, MA. She had four grandchildren, Matthew, Sarah and husband Lucas Osborne, Elizabeth and Evan, and a great-grandchild, Vivian. A Mass of Christian Burial will be offered at 10 AM on Saturday, February 11, 2012 at St. Mary's "Our Lady of the Lake" Roman Catholic Church, 31 Elm Street, Cooperstown, with Fr. John P. Rosson, pastor, presiding. In lieu of flowers, a contribution can be made to Friends of Bassett, 1 Atwell Road, Cooperstown, NY 13326. Their secured "Online Donations" page at www.bassett.org can also be used to direct contributions in her memory.